Future demand in agricultural output is supposed to match the needs of 9 billion people with less input of resources. Can we transform our agricultural practices and move behind existing paradigms to develop innovative and sustainable agriculture production systems? A transformation of the regime is needed: a change in the socio-economic system through new narratives and diversification. Not driven by monopolizing technologies but supported by innovation, knowledge and careful evaluation of sustainable technologies and farming practices. 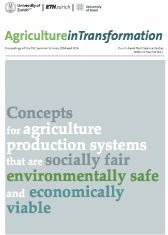 What could be possible trajectories towards a sustainable agriculture and food system? The Zurich-Basel Plant Center is pleased to invite you to the public final event of the Marie Curie Fellowship program IDP BRIDGES – Bridging Science and Policy. At this event, we will be featuring a key note talk given by Dr. Marco Lambertini, Director General at WWF International. He will present highlights of the Living Planet Report 2016. He will show how scientific evidence has been integrated in this report and how researchers can actively contribute to WWF. For example, to strategy papers. Moreover, he will define the role of WWF International as an NGO at the interface of policy, science and the civic sector.